Written in convenient ‘third person’ voice, to facilitate copying, pasting, reprinting, whenever necessary…. Also, see Alex Rivera on Wikipedia. Alex Rivera is a filmmaker who, for the past twenty years, has been telling new, urgent, and visually adventurous Latino stories. 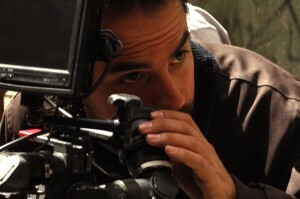 His first feature film, Sleep Dealer, a science-fiction feature set on the U.S./Mexico border, won awards at the Sundance Film Festival and the Berlin International Film Festival, was screened at the Museum of Modern Art, and had a commercial release in the U.S, France, Japan, and other countries. Alex is currently developing Sleep Dealer as a TV series with the support of a major studio. In 2015 Alex was awarded major support from the Surdna Foundation and the Ford Foundation for his film-in-progress, ‘The Infiltrators,’ and he received an Art & Technology Lab Grant from LACMA, as well as support from Time Warner for an experimental project in virtual reality. Other recent collaborations include a series of activist music videos produced by the National Day Laborer Organizing Network (NDLON) with artists including Manu Chao, La Santa Cecilia and Aloe Blacc, which have collectively received over 20 million views. Alex studied at Hampshire College. Alex Rivera is a New York based digital media artist and filmmaker. He was born in 1973 to a native of Peru and a native of New Jersey. Growing up in a bi-cultural channel surfing tract home led him to rethink some assumptions about race, immigration, identity, and the global economy. Over the past fifteen years he’s been making work that illuminates two massive and parallel realities: the globalization of information through the internet, and the globalization of families, and communities, through mass migration. Rivera’s work uses many different techniques to try to describe these realities. He began his career working in the form of political satire and ‘fake documentary,’ but over time, his work fractured, and now also includes work in narrative and traditional documentary. Even though he has not been faithful to one particular form or another, Rivera’s work always skews towards discussing the surreal elements of political realities, and it always strives to be both accessible and critical. Alex Rivera’s work demonstrates that complex arguments can be made clear and simple through the audio/visual medium. Papapapá (USA 1995) used the concept of “virtual reality” to describe the mental space Rivera’s Peruvian father inhabits in his adopted home of upstate New York. The video describes how technologies of communication like the television, the telephone, and the internet allow new immigrants like his father to inhabit a ‘third reality’ – neither here nor there. In Papapapá Rivera called this in-between space a “virtual reality: VirtuaLima. In his second film, Why Cybraceros? (USA 1997), Rivera sarcastically imagined a future in which migrant farm workers (or Braceros) could work in America, but never actually come to America, by controlling robotic workers over the internet from their country of origin. The Cybracero concept started as a surrealist satire of anti-immigrant politics, and internet utopianism in 1997. Strangely, it has become reality today in Indian “call-centers” in which thousands of people work in America over the net, but may never participate in any other way in U.S. society. The Sixth Section (USA/Mexico 2003) took a different look at immigration and “the net.” The Sixth Section tells the story of how immigrants from the same small Mexican village re-organize in the U.S., and ultimately use the net to find political and economic power in their hometown in Mexico. “The net,” (in this case meaning money transfer services, cheap phone service, and home video) allows the uprooted population of immigrants to virtually return home, and find power. In his most recent film, Sleep Dealer (USA/Mexico, 2008) Rivera synthesizes these explorations into a ground-breaking science-fiction feature film set on the U.S./Mexico border. Sleep Dealer takes many of the premises he explored in Why Cybraceros? and The Sixth Section, and combines them in a personal, emotional, and surreal narrative that follows a migrant worker in the near future. The distribution of Alex Rivera’s work has taken him through a set of wildly varied venues, through communities as diverse and divergent as the Saturday afternoon crowd at the Guggenheim and the Migrant Ministers of Tampa, Florida. Since he builds his films and videos from inspirations such as immigration and the internet, he ensure that the works open themselves up to new audiences, audiences that defy history and expectation.